Fortified after the Festive celebrations there was a plentiful supply of eager anglers out at Lochter between Christmas and New Year. Many of them had a dazed ‘ cabin fever’ look in their eyes that could only be assuaged by a bit of piscatorial pleasure and copious amounts of fresh air. Fishing conditions were far from ideal but steely resolve was in plentiful supply and those who did venture out were rewarded with some hard fighting overwintered fish. The Blobby boys (Doug & Billy) had a ‘Christmas Cracker’ of a session getting into double figures on buzzers, blobs and whotsits. Steve Corsar came out for a 4-hour session with his fishing buddy and workmate Alan Patterson who apparently had a different kind of session (imbibing) the night before. Suffice to say Steve caught 16 fish on small buzzers but it was not recorded what Alan caught although he appeared to be doing a splendid ghillying job for Steve who is obviously someone he aspires to emulate one day! Scott Sim from Ellon delicately fished okay dokay’s and was rewarded with 10 fish while Paul Ingram from Newmachar brought 9 fish to the net on cormorants and okay dokay’s. Pete Green from Huntly and Graham Duthie both had 8 fish on the bloodworm, Rhys West landed 7 fish on lures and nymphs and Charlie McPhee also had 7 fish on the JCM lure – (I’ll have to ask him what this stands for next time I see him). The ever-persistent Brian Ross, on light tackle, caught 6 fish on small nymphs and Neil Buchan also had 6 fish this time on cormorants. Our first competition of the 2018 season will be the Rabbie Burns Pairs on Sunday the 28th of January. This is a very popular event with some nice prizes. As per previous years the competition will start at 9.30am and finish around 2pm when there will be the traditional haggis, neeps and tatties lunch followed by the prize giving. To confirm your entry contact Stuart at the bothy on 01651 872787. At time of writing a southeasterly wind is helping to clear some of the ice after the recent hard frosts so there are good areas for fishing available. 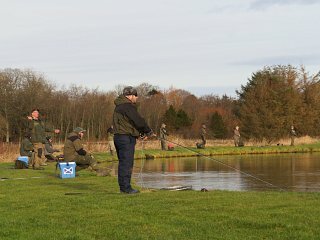 Fortified after the Festive celebrations there was a plentiful supply of eager anglers out at Lochter between Christmas and New Year.